International Book Giving Day: Happy International Book Giving Day! Happy International Book Giving Day to each and every one of you giving books to kids today! It is a pleasure to have you joining us from Australia, Canada, South Africa, France, India, Ireland, Japan, the Philippines, Spain, Turkey, the United Kingdom, and the United States (thus far)! Things you can do today to celebrate! Give a book to a child as a Valentine’s Day present. Borrow a book from the library, and share it with a child. Rifle through your bookshelves for children’s books that could use a better home, and donate them to a good cause within the next week. Consider donating your books to your local library, second hand store, children’s hospital, shelter, after-school program etc. Identify a waiting room with few to no good children’s books, and commit to leaving a book in that waiting room within the next week. Donate money or time to a charity working to distribute books to kids. Today is the last day to commit to giving a book to a child. If you haven’t already, decide how you will celebrate International Book Giving Day, and add your name to our list of people giving books to kids for International Book Giving Day. See We're Giving Books above. If you have the chance, take a picture of your act of giving. Send your pictures to me via email (amy dot broadmoore at gmail dot com), Facebook, or Twitter, or add them directly to International Book Giving Day’s flickr group. Lastly, enjoy the photos and stories that people are sending in about their acts of giving. See Photos & Stories. What are you doing to celebrate International Book Giving Day? Thanks for sharing, Natasha! Have a wonderful day! I've just made a donation to Book Aid International - they're a wonderful charity, which I've supported before, and it's lovely to now have a special day on which to support them again. A day dedicated to getting new, used, and borrowed books in the hands of as many kids as possible. Help spread the word about International Book Giving Day! - Invite your friends to participate! Send an email or share on Facebook. 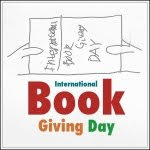 - Like International Book Giving Day's Facebook page. 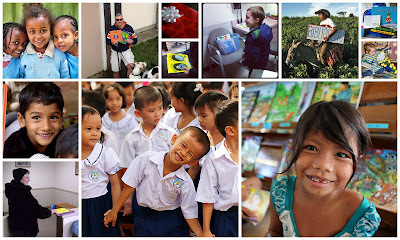 - Connect with International Book Giving Day via Facebook, Twitter, and Pinterest, and repost, retweet, and repin when you feel moved to do so. - Inspire others by sharing your plans and pictures on International Book Giving Day's Facebook page, adding pictures to International Book Giving Day's Flickr group, or emailing pictures to amy dot broadmoore at gmail dot com. - Let us know that you are participating (e.g. giving a book to your niece or donating used books to a good cause) and that you are willing to have your name added to our list of authors giving books. - Invite others (especially authors outside the U.S. and U.K.) to participate. - Share a photo of you giving books! - Would any other illustrators like to create an International Book Giving Day bookplate? We would especially welcome bookplates from illustrators outside the U.K.
- Write a post encouraging readers to give books to kids this February. - Post the International Book Giving Day badge on your blog, and add a link to this page or to International Book Giving Day's Facebook page.